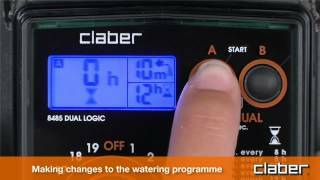 A single water timer with a wide selection of pre-set times to manage two independent irrigation lines with the utmost simplicity, pressing just a few push-buttons. Battery-operated, therefore, no electrical connections required: simply screw it onto the tap and it is ready to use. You can choose from 19 pre-set programs for all the most common irrigation needs and interrupt them at any time. Equipped with backlit LCD screen and practical delayed start function of the selected program. Tried and tested for reliable, hassle-free operation, it is fitted to connect with the Rain Sensor device, which interrupts the selected program in the event of rain and starts it again automatically when the rain has stopped. Two-way automatic water timer, with watering on two independent lines. Powered by 2 x 1.5 V AA alkaline batteries, fitted in a rainproof socket. Easy programming with a single digital button. 19 preset programmes (+ off) for each line, listed on the front cover. Backlit LCD screen displaying the different functions (programming, time remaining, watering time, rain sensor). Start button allowing immediate or delayed (up to 23 hours) start, on both lines. On/off button for manual function (5-minute test). Reinforced structure. Bimaterial front panel. Transparent protective cover. Electronic components fully insulated, no wires exposed to view. 3/4” tap connector with pivoting ring nut. Washable filter. Operating pressure 0.2 – 12 bar. Can be connected to standard Rain Sensor (90915) or to wireless RF Rain Sensor (90831 – with optional interface). 100% checked and tested.